Gated community with high quality family amenities. 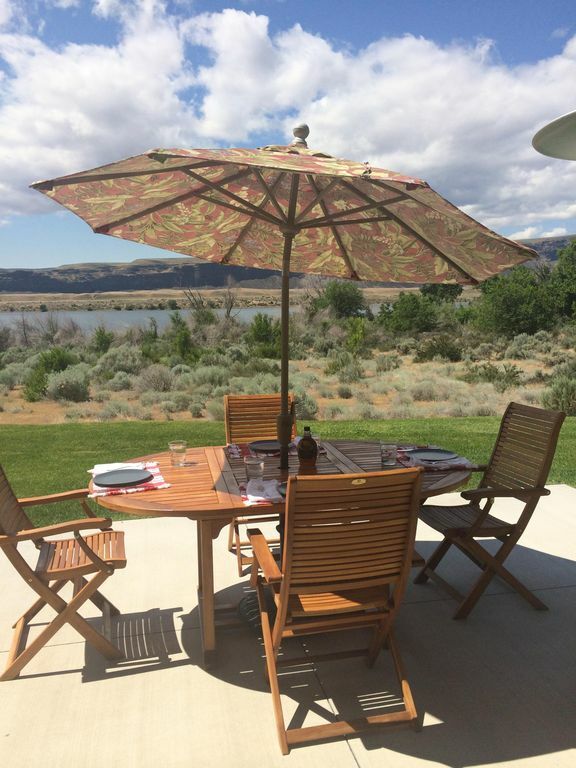 We enjoy spending time with friends in the sun @ Crescent Bar! Gated community on the Columbia River. Dam downstream gives Crescent Bar the feeling of a lake. Almost no current. House faces the river. A/C for summer, heated floors for winter. Three bedrooms with a loft. Two masters, bonus room with three queen beds, loft for a blowup bed (provided). Sleeps 10 in beds plus blow up bed. Walking distance to pool, hot tub, play ground for kids, tennis court, basketball, work out room (extra charge). Nine hole par three golf course across the street. Two more golf courses short drive away. Restaurant bar & neighborhood. Two other restaurants with bars around half mile away. Master shower & tub. Additional shower on main floor in laundry room. Powder bath on main floor. Bath with shower on second floor. House is waterfront. Land between house & water is PUD owned. Trail by house to beach about 200 foot walk. Yes, private tennis court in neighborhood. Par three course across street. Two additional courses nearby. Short drive. Bring your boat. Boat launch nearby. Boating & beaches are very popular @ Crescent Bar! This was our second time being lucky enough to book and enjoy this special place! Thank you so much! Large house, plenty of sleeping space, clean, great kitchen, and great amenities. Upon arrival it was nice pulling into a gated community, the house was large with multiple sleeping areas to accommodate all that was in our group. Plenty of room for parking 3 cars in the driveway and room to park our boat. The A/C worked extremely well for the 100 degree temps that we had that weekend and the heated floor in the living room was awesome during the evening. The house was wired with surround sound stereo so you could plug in you music and hear it outside or turn individual zones down. There were corn hole boards in the garage that made for great past times out side, grass was perfectly manicured. 3 bathrooms made it nice for when one needed it. Full size washer and dryer, lots of fridge "house had ice maker in freezer and garage" to keep your drinks refreshingly cold. The gated pool and hot tub were nice for when we got off the water, saw lots of families using it during the day. Quick 5 min drive down to the boat launch made it easy to load everyone in 1 truck and head for the water, great thing about crescent bar is you have tower pizza that you go sit down and get food and drinks/ kid friendly, and there is fuel on the water. You can pull your boat up and top it off. " $4/ gallon for premium non ethanol, which is the going rate around the sate." Owners were awesome to deal with, we booked last minute and they wasted no time getting me the information on how to access. Garbage dumpster a short 1 minute walk made for easy disposal. Absolutely enjoyed our stay and looking forward to doing it again. A perfect vacation home. Plenty of space. Amazing view! Pool is close. Trail and river are close! We (3 couples,3 kids under 6yrs) had an amazing time. The weather was great. We rented a boat from Wenatchee and brought it with us for the trip,(crescent bar has boat rentals but they were booked) if you can do this I would recommend it. We did rent a seadoo from crescent bar one day, another fun activity. We've stayed at other Crescent bar locations and think we like Crescent Bay the best this far. Things to remember: Sun Screen, 3x the amount liquids you think you'll consume, Sun Screen! Water skiing & swimming are very popular @ Crescent Bar. You can always find smooth water. Private neighborhood pool, hot tub, tennis court, basketball & play ground for the kids. All one block from house in gated community. Golf course across street. Two other golf courses a short drive away. Winter, skiing @ Mission Ridge less than an hour away. Crescent Bar is in the dessert of Eastern Washington, warm & dry. Bring a ski boat, swim suit, water toys & suntan lotion!! Sandy beach & access to two boat ramps with parking 1/4 mile away. Gorge Amphitheater & lovely Cave B Inn & Winery 25 minutes away. There are several wineries within 1/2 hour, many more within an hour for wine tasting.